Wanda Koop’s In Absentia series was inspired by a recent residency in New York City. Struck by the sensation of light and color in the ever-shifting skyline, Koop created dozens of drawings and paintings that filter this experience through a pared-down geometry of buildings silhouetted against the sky. 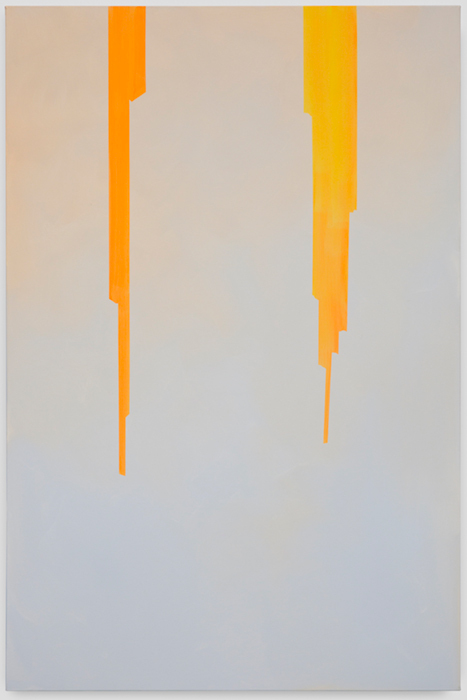 The bright orange-yellow radiating between the buildings of In Absentia (Misty Blue-Translucent Orange Yellow) recall the quickly shifting light at dawn or dusk when the sun is low in the sky. Koop paints a subtle gradient of peach to blue on the buildings, evocative of that brief, magic moment when the natural world transforms the urban environment. Koop’s painting career spans four decades, and her work has been exhibited internationally. A major survey of her work was mounted by the National Gallery of Canada in 2011. Koop has been the recipient of numerous awards, honorary doctorates, and Canadian medals of honor, including the nation’s highest civilian honor, the Order of Canada, in 2006.